Exploring the U-He Diva – Huge Analog Sound in a Compact Digital Interface! While the U-He Diva certainly isn’t the first plugin to model an analog-style subtractive synthesizer, U-He’s immense attention to sonic quality and detail has made it one of the best available. With multiple oscillator and filter modes, dedicated modulation and effects sections, and a master section to bring it all together, the U-He Diva can deliver some serious analog warmth and character to your productions – all the while featuring the many conveniences associated with modern in-the-box digital synthesis. With devices that feed from left-to-right in a modular fashion, it combines an easy to use interface with powerful sound shaping tools that are as simple or complex as you need them to be. Of hundreds of plugins tracked in projects by the Splice client, this plugin is also currently 18th most-popular among Splice users! Let’s explore some of the main features of the U-He Diva to see what it can contribute to your sound. At the heart of the U-He Diva lies its four independent oscillator types, TRIPLE VCO, DUAL VCO, DCO, and DUAL VCO ECO – each of which are modeled on classic analog-style synthesizers and are suited to accommodate specific types of timbres and support specific types of analog-style functionality. You can switch between these oscillator types by using the dropdown menu located at the bottom of each module. “VCO” refers to Voltage Controlled Oscillator, a traditional electronic oscillator in which the oscillation frequency is controlled by a voltage input, which then determines the instantaneous oscillation frequency. “DCO” refers to Digitally Controlled Oscillator, an oscillator type that was developed to overcome the tuning stability limitations of early VCO modules. Let’s take a closer look at these four oscillator modules to note some of the similarities and differences between them. All oscillation modules in the U-He Diva allow you to select a waveform shape for each oscillator, which is determined by either a continuous WAVEFORM KNOB or a WAVEFORM SELECTOR SWITCH, depending on which module you are currently using. Here you can choose from various waveform types, including SAWTOOTH, TRIANGLE, RAMP, SQUARE, SINE and PULSE. The VCO modules have additional NOISE generator devices for adding character to the signal, while the DCO module has an additional SUBOSCILLATOR device for adding lower harmonic frequency elements for thickening up your sound. Each of these wave shapes has very particular characteristics. It’s important to try them out for yourself and understand the audible differences, as it is this first step that will determine the timbral qualities of your finished sound more than any other factor further down the line. Once you’ve established the wave shape type, the U-He Diva gives you many more options for further sculpting your sound. Each oscillator also has an associated RANGE, TRANSPOSE, or OCTAVE knob, each of which does exactly the same thing, which is to specify the operating frequency of the oscillator. By adjusting one of these knobs, you will effectively double or halve the operating frequency of the selected oscillator, which in musical terms corresponds to the difference between exactly one octave and the next. Each of the oscillator types provides you with a number of freely assignable knobs as well. Any knob with gray lettering can be designated by right clicking it and then selecting the desired modulation source or action. The Diva offers up to twelve modulation sources and ten functions to choose from for truly flexible synthesis and nearly endless possibilities. Directly to the right of the oscillation module, the U-He Diva provides you with a multifaceted combination module that will change depending on which oscillator type you are currently using. In TRIPLE VCO mode, this section is a mixer that allows you to control the relative amplitude of each of the three oscillators, as well as a FEEDBACK knob and a NOISE knob to give you further options for enhancing your sound. While using any of the other three oscillator types, this module can be switched to one of several options depending on the sound that you’re trying to achieve: FEEDBACK and HPF POST, which are applied after the filter section, and HPF PRE and HPF BITE, which are applied before the filter section. Experimenting with these variations will allow you further sound shaping capabilities both before and after the signal is introduced to the filters. The U-He Diva’s filter section features smooth sounding and continuous operation that arguably rivals any hardware synthesizer. You’re provided with four independent filter types: LADDER, CASCADE, MULTIMODE, and BITE. All filter types provide you with common controls such as CUTOFF, RESONANCE, and KEYBOARD TRACKING, as well as an FM knob that allows you to modulate the action of the filter by way of the oscillator module. There are also several specific features that are unique to each filter type. In LADDER mode, Diva features an EMPHASIS knob that corresponds to resonance and a selectable DEPTH SWITCH that will adjust the depth of the cutoff frequency to either 12dB or 24dB. CASCADE mode features a ROUGH/CLEAN switch that alters the overall tonal character of the signal and has a noticeable effect on the amount of resonance at the top end of its range. By using the MULTIMODE filter, you’re provided with multiple filter subtypes, including a four-pole low-pass filter, a two-pole low-pass filter, a high-pass filter, and a band-pass filter. Although BITE mode appears to have no necessarily distinguishing features compared with the other filter modes, it can actually sound quite different. The tone is highly dependent on input signal levels, the selected revision levels via the REV selector, and the value of the peak resonance. Like the oscillator modules, each of the filter types also provides you with a number of freely assignable knobs. Any knob with gray lettering can be designated by right clicking it and then selecting the desired modulation source or function. The U-He Diva’s Envelope Section is fairly straightforward. Diva offers you two independent envelopes, each with three envelope types: ADS, ANALOGUE, and DIGITAL. The ADS envelope is a simplified ADSR envelope, which is short for Attack, Decay, Sustain, and Release. In this module, the decay and release values are shared, with the option of switching the release off via the RELEASE switch so that even a long decay will stop as soon as the note is released. The ANALOGUE envelope is identical to the ADS envelope except that it allows for independent control of these values via the RELEASE and DECAY faders. Finally, the DIGITAL envelope provides you with all of the above features except that it has optional CURVE and QUANTIZE switches. The CURVE switch affects the overall curve shape of the envelope, while the QUANTIZE switch creates a choppier, less smooth overall curve. All modules have a VELOCITY fader that determines how much note velocity will affect the envelope, as well as a KEYBOARD fader that determines the sensitivity of the envelope to reset itself when a new note is received. Once you have your sound dialed in, it’s time to explore the many versatile global controls that reside below the main synthesis unit and that provide you with the means to precisely control, manipulate, and modulate your patch. LFO refers to Low Frequency Oscillator, which is an oscillator that operates at frequencies below the range of human hearing but that still has the capacity to modulate or trigger external functions. At left, we’re presented with two LFO control submenus that allow you to control the shape of the LFOs via the WAVEFORM menus, their rates via the RATE knobs, their syncing mechanisms via the SYNC menus, and their trigger behaviors via the RESTART menus. You’re also provided with further adjustments for fine-tuning such as PHASE and DELAY controls. Both the RATE MOD and DEPTH MOD knobs are freely assignable to any available external source, such as a mod wheel or an expression pedal. The tuning module offers a way for you to further fine-tune your patch’s tonal playability functions, with options for enhanced GLIDE control, PITCH BEND RANGE, VIBRATO control, and even a MICROTUNING engine with which you can import irregular tuning algorithms in to the U-He Diva. The amplifier and pan module controls everything immediately before the final output stage, such as the primary VCA ENVELOPE SOURCE and the final panning position in the stereo field via the PAN knob. This section also provides you with the option to freely assign independent modulation sources to these characteristics via the VOL MOD and PAN MOD knobs. The U-He Diva’s effects section is comprised of two separate effects modules that each contain five world-class effects: CHORUS, PHASER, PLATE, DELAY, and ROTARY, each with relevant controls to further enhance your sound and define its place in your mix. Just when you start to think that the U-He Diva couldn’t possibly have any more tricks up its sleeve, you can open up the MASTER tabs at the very bottom of the unit to expose even more options. The available submenus are MAIN, MODIFICATIONS, TRIMMERS, SCOPE, and PATCHES. It’s here that you can control everything from polyphony modes to advanced filter operations, modulation behaviors to advanced oscillator tunings, and everything in between. Diva even provides you with a handy waveform oscilloscope so that you can visually identify the waveform of the final output as you tweak your settings and sculpt your final sound. By clicking on the PATCHES menu, you’re rewarded with a wealth of valuable presets that you can use as-is in your productions or to help you better understand this mammoth of a synthesizer. 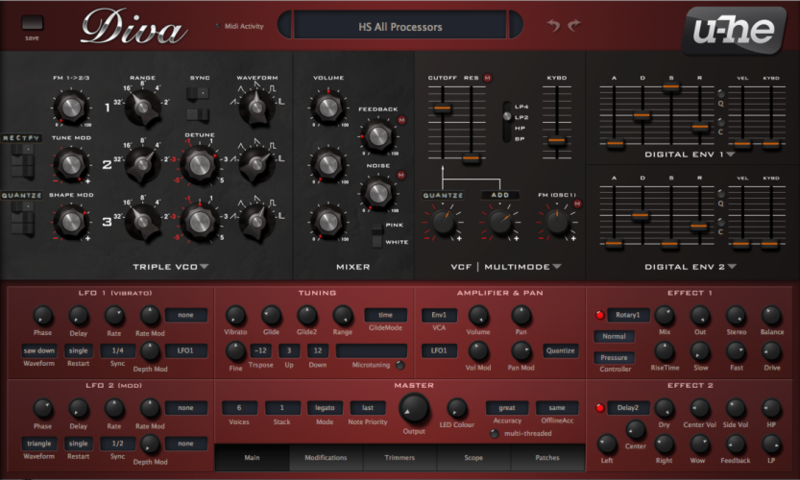 The U-He Diva is available for Windows and OS X platforms in VST2, VST3, AU, and AAX formats, and is compatible with both 32-bit and 64-bit DAWs. You can purchase the U-He Diva for $179 or download a demo version from their web store here.